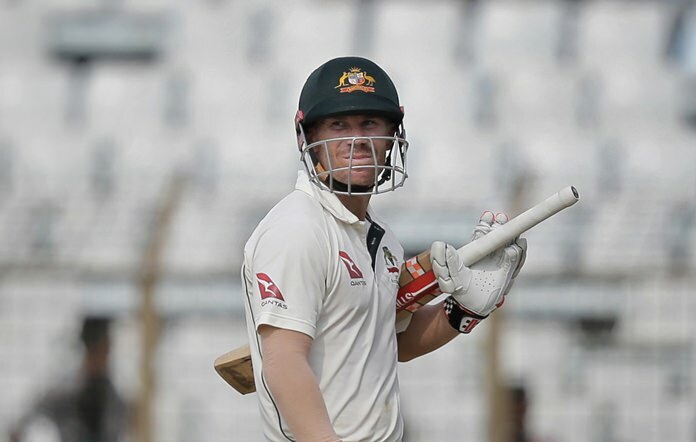 Chittagong, Bangladesh (AP) — Australia opener David Warner hit his 20th test century as his team took a 72-run lead Wednesday by reaching 377-9 against Bangladesh on the rain-affected third day of the second test. Warner scored 123 runs off 234 balls, including seven fours. He scored 112 in the second innings of the test in Dhaka in a losing cause. It was Warner’s second longest innings after his 286-ball knock against New Zealand in 2015 in a match in which he made his career best 253. “I think from a patience point of view, definitely (it was my best),” Warner said. “I always talk about trying to bat long periods for time in these conditions and by far that’s the hottest I’ve ever played in. The start of the day was delayed by heavy rain, after which Warner and Peter Handscomb resumed on 225-2. With Warner reaching 99 without hassle, Handscomb was run out as Shakib Al Hasan made a direct throw from square leg, ending the 152-run partnership. Handscomb hit six boundaries in his 144-ball 82. Warner waited for 16 balls before he cleared the boundary with a cover drive to reach the three-digit figure. Pacer Mustafizur Rahman, who turned 22 on Wednesday, dismissed Warner as Imrul Kayes completed the catch at leg gully on the third attempt. Glenn Maxwell and Hilton Cartwright surpassed Bangladesh’s first innings total 305 before the latter was dismissed by offspinner Mehidy Hasan just before tea. Maxwell, reprieved on 10, kept the side on course until Hasan dismissed him with a delivery that spun to touch his glove before wicket-keeper Mushfiqur Rahim dived forward to take it. Maxwell faced 98 deliveries and scored 38, with three boundaries. However, his dismissal effectively blocked Australia’s way to a big lead as Rahman and Hasan made Australia nine down before bad light brought a pre-mature end to the day. Steve O’Keefe was batting on 8 with Nathan Lyon yet to score. Rahman (3-84) and Hasan (3-93) picked up three wickets apiece, while Al Hasan and Taijul Islam took one each.